Minnesota pretty good about not turning the ball over and getting to the FT line (fueled by Jordan Murphy). Everything else is pretty suspect. Minnesota is missing Reggie Lynch and probably Amir Coffey with Dupree McBrayer on a bad leg from the last time these two teams played. The Gophers start and end with Mason. The Senior PG is their primary 3pt threat, is 2nd on the team in scoring average, and first on the team in assists. With the loss of noted creep Reggie Lynch, the at-one-time ranked Minnesota Gophers have lost 8 of their last 9. In addition to losing Lynch, talented starter forward Amir Coffey 7 of the last 9 games with a shoulder injury and Dupree McBrayer isn't practicing because of a bad leg. Compounding the problem has been Minnesota's lack of talent on the bench. The one bright spot has been Isaiah Washington who grabbed the latest B1G freshman of the week award behind some big double digit scoring efforts vs Iowa and Michigan. Nebraska doesn't fare all that well against surprise players but we should have enough game tape on Washington's lack of a 3pt shot and mid-range tendencies to slow him down. Offensively for the Gophers it will be Murphy, Mason, and Washington. Expect the Huskers to double Murphy at times and try to slow down the others with multiple defenders. Should Minnesota get hot, the Huskers can throw a zone at them much like Michigan did in their last game. Given how much small ball the Gophers have been running, it will be tough for Minnesota to punish Nebraska with offensive rebounds. This really seems like a game where a fresh-legged Nebraska team can clamp down and impose their will against the limited roster of Minny. Offensively who will be along for the ride with James Palmer and Issac Copeland? A lot has been said about the struggles of Glynn Watson's shot but Evan Taylor and Anton Gill have combined for 10 total points in their last 3 road games. Did these guys spend the last week working on their shots? One thing to potentially look for is some Jordy offense, especially if Minnesota tries to counter with human folding chair Bakary Konate. The big guy looked at ease vs Konate back in Lincoln. Nebraska has yet to win at the Barn in B1G play. 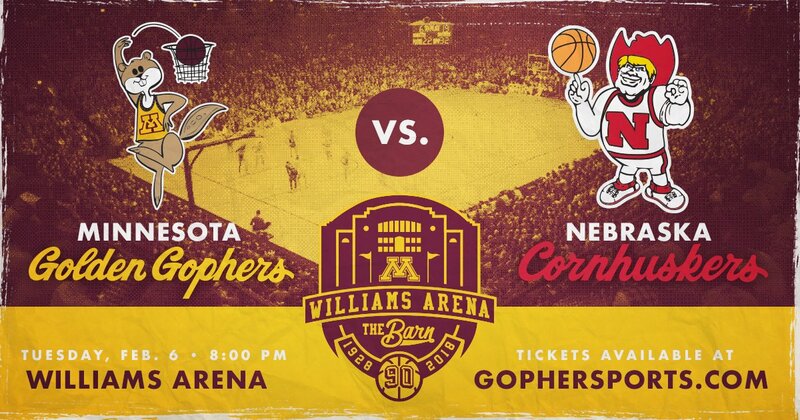 While there should be some excitement for the Barn's 90th birthday, there are still lots of seats available because of how bad this Gopher team has become. Have the Huskers bought into the NCAA tournament hype? As long as they play with any sort of effort they should be in this ballgame with a chance to win. Add that up with the 8 days that Miles has had to prep for this game against a guy he was already out-coaching in Richard Pitino and you have to feel pretty confident about a Nebraska win tonight.